Mt. 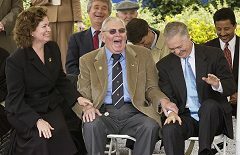 Airy, NC (16 Oct 2002) - Andy Griffith returns for dedication of the Andy Griffith Parkway and has fans laughing along with his accounts of life in his boyhood hometown. Story below. * Nov. 6 and 7: Mayberry Deputy David Browning cuts to the East Chase Shopping Center grand opening in Birmingham, Ala.
* Nov. 9: GEORGE LINDSEY performs at the Rock Crusher Canyon Amphitheater in Crystal River, Fla.
* Nov. 21: DON KNOTTS and Tim Conway perform at the Huntington Civic Arena in Huntington, W.V. For more information, call (304) 523-5757 or any Ticketmaster outlet. * Nov. 23: DON KNOTTS and Tim Conway perform at 8 p.m. at the Miller Auditorium in Kalamazoo, Mich. For info, call 1-800-228-9858. * Nov. 24: DON KNOTTS and Tim Conway bring their show to Palace Theater in Marion, Ohio. Call (740) 383-2558 for info. * Nov. 30: THE DILLARDS perform with Arlo Guthrie and Peter Seeger at Carnegie Hall in New York City. * Dec. 6-8: JIM NABORS hosts "A Merry Christmas with Friends and Nabors" at the Hawaii Theatre in Honolulu. For info or tickets, call (808) 528-0506. * Feb. 4: GEORGE LINDSEY performs at the Springbrook Country Club in Niota, Tenn.
* Feb. 15: Mayberry Deputy David Browning fiddles around at the Blue Ridge Jamboree in Mount Airy, N.C.
* Feb. 15 and 16: GEORGE LINDSEY performs at the Cypress Gardens Amusement Park in Cypress Gardens, Fla.
* Mar. 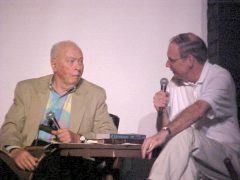 8: DON KNOTTS and Tim Conway perform at 4 p.m. and 8 p.m. at the Ritz Theatre in Tiffin, Ohio. For more information, call (419) 448-8544. * Apr. 24-25: THE 6TH ANNUAL GEORGE LINDSEY TV AND FILM FESTIVAL at the University of North Alabama. 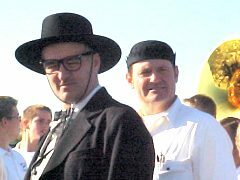 Mayberry fans are treated to Harvey Bullock as the featured guest at Neal Brower's yearly lecture at the Cinema on Saturday afternoon of Mayberry Days 2002. * July 11 and 12: "Mayberry in the Midwest 2" in New Castle, Ind. 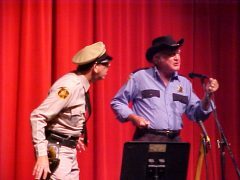 Favorite "tribute artists" David "Mayberry Deputy Browning, Allan "Floyd" Newsome and Kenneth "Otis" Junkin are confirmed. Cast members and details will be announced as they are confirmed. For updates and more information, visit http://www.mayberryinthemidwest.com. * Sept. 25-27: 14th Annual Mayberry Days in Mount Airy, N.C. For tickets, call 1-800-286-6193. Visit http://www.surryarts.org/ for more information. Again, check the Events Calendar at http://www.tagsrwc.com/ for more information and updates. "Goober Says Hey, Andy" "Hey to Goober"				Nashville, Ind. Butter His Bread on and a Few Hours Later He's a Genius! It Could Only Happen in America"					Walhalla, S.C.
Mayberry, the Friendly Town						Lancaster, S.C. If you are interested in starting a chapter of TAGSRWC, all you have to do is pick a name that has not already been chosen and submit a list of your founding members by postal mail to TAGSRWC's HQ at 9 Music Square South, PMB 146, Nashville TN 37203-3286. (You can find a list of names that are already taken online at http://www.tagsrwc.com.) We'll then verify your chapter name choice and send you an official Chapter Charter. Or if you would like to join or contact an existing TAGSRWC chapter in your area, write to TAGSRWC's HQ (see address above) and we'll help get you in touch. Perhaps the most significant Mayberry happening of the year was ANDY GRIFFITH's return to his hometown of Mount Airy, N.C., for his first official public appearance there in 45 years. The Oct. 16 dedication of the Andy Griffith Parkway was a grand occasion for fans, Mount Airy, and Andy and Cindi Griffith. Andy and Cindi also visited the Grace Moravian Church where Andy worshipped in his teen years and the Mount Airy Granite Quarry. He also passed by the Snappy Lunch after hours and saw Floyd's Barbershop. 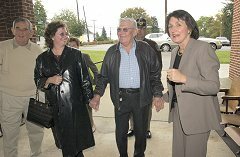 The Griffiths then had a private dinner that evening with dozens of relatives, many of whom they had never before met. They spent the night at Andy's childhood home place, which is now a bed-and-breakfast landmark. The next day, amid Mayberry gold truck-style drizzle, assorted dignitaries, including Gov. Mike Easley and the Moravian band, were on hand for the dedication of the Andy Griffith Parkway. Andy captivated the crowd of about 3,000 admirers braving the weather as he shared his memories of Mount Airy and his entire career. He got particularly joyful responses when mentioning places like Snappy Lunch, even as he confessed, "I've never had a pork chop sandwich in my life." Upon reflecting on all of the apparent similarities between Mayberry and Mount Airy, Andy tantalized the crowd when he said, "People started saying that Mayberry was based on Mount Airy." He paused and with a sly grin added, "It sure sounds like it, doesn't it?" About that time, rays of sunshine began breaking through the cloud cover. 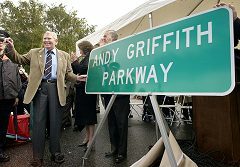 Andy and the Governor then unveiled a sign saying "Andy Griffith Parkway," the new official name for the stretch of U.S. 52 that is already being affectionately nicknamed simply "Andy's Road." But the unveiling and the renaming of that section of U.S. 52 are almost footnotes to the greater significance of the day. The big news was that Andy was back in town. As a certain skinny deputy once exclaimed, "Aw, big ain't the word for it!" He was right and Thomas Wolfe was wrong. Indeed, as Andy said at the dedication, "This is the biggest day of my life." Welcome home again, Andy Griffith! DON KNOTTS has been on the road a lot in recent (and upcoming) weeks with his tour with Tim Conway. He also has been doing some voice-over work for animated projects. RON HOWARD is serving as executive producer on several film projects affiliated with his Imagine Entertainment company, but he is still pondering what his next project as director will be following his Oscars for producing and directing "A Beautiful Mind." JIM NABORS has been staying close to home after a handful of concerts on the Mainland earlier this year. He hosts his annual Christmas concerts in Honolulu in December. GEORGE LINDSEY has recently had to cancel a couple of dates because of a back injury, but he's champing at the bit to get back on the comedy circuit with dates beginning in early November. He has also been heavily involved in planning for his sixth annual film festival next spring. RODNEY DILLARD is pleased with how his performance of "There Is a Time" (including a brand new verse) with Ricky Skaggs turned out on the new "Will the Circle Be Unbroken, Vol. 3" release. The Dillards will be touring some in the coming year with folks such as the Nitty Gritty Dirt Band and Arlo Guthrie, including a plum engagement at Carnegie Hall on Nov. 30. Dillards bass man MITCH JAYNE is still writing and editing for the "The Shannon County Current Wave" newspaper in Eminence, Mo. And he still does freelance writing and gives occasional lectures throughout Missouri. As we reported in the August "eBullet," JOY ELLISON (Mary Wiggins, Effie Muggins, Mary Scobey and other Mayberry kids), was working on location in Prague as dialect coach on the film "The League of Extraordinary Gentlemen," starring Sean Connery. Not long after that, Joy and the rest of the film crew were part of the emergency evacuation of Prague as the city dealt with the devastating floods. She also recently did dialect work on the soon-to-be-released musical "Chicago" starring Catherine Zeta-Jones, Renée Zellweger and Richard Gere. That's our news from the cast and crew for this issue. We'll have more updates in the December "eBullet." We have several brand new items at Weaver's since the last "eBullet." And by mid-November, we expect to have about two dozen more items online at Weaver's that we haven't offered before, including some T-shirts, sweatshirts, blankets, pennants, autographed items, badges, and patches. Plus there's a brand new salt-and-pepper shaker set that we're expecting any day now. You can also find most of our items at our location on the third floor of the Main-Oak Emporium at 245 City Hall Street in Mount Airy, N.C.
A selection of our most popular items is available at 9 Music Square South in Nashville, Tenn., Mon.-Fri. from 9:30 a.m. to 5:30 p.m. (check or cash sales only). And our newest location is in the Emporium Shoppes at the Village, located at 142 Main Street East, in Banner Elk, N.C. This location is up in the mountains near where the Darlings might like to hang out. Though our shop there is more on the scale of Bert Miller's vending stand than a full-blown Weaver's, you will find pretty much our full array of items at the new Banner Elk location. 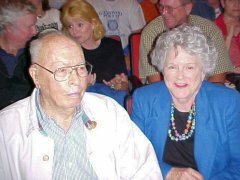 An hour-long, professionally produced video of the dedication ceremony for the Andy Griffith Parkway in Mount Airy on October 16, 2002, is now available to order from Weaver's. The tape features approximately a half an hour of comments by Andy Griffith. Price: $20.00. BONUS: While our supply lasts, we'll include with each video order a free copy of "The Mount Airy News" from Oct. 17, which includes extensive coverage of the Dedication festivities. This handsome new desk clock features Andy, Barney, Opie and Gomer in a nostalgic copper-colored metal casing. The diameter of the clock face is 4 inches and the clock is over 2 inches thick. The clock features a sweep second hand and an alarm. A double-A battery is included. Price: $20.00. Spearheaded by the Nitty Gritty Dirt Band, this outstanding new Double CD release of 28 superb tunes by top folk, bluegrass and country music artists has one cut that will be of particular interest to Mayberry fans. Disc 2 includes "There is a Time," a favorite song performed three times on "The Andy Griffith Show." The song, written by Darling boys Mitch Jayne and Rodney Dillard, features Rodney and Ricky Skaggs on this CD. A special "bonus" is that the version on this CD includes a brand new fourth verse that Mitch and Rodney wrote especially for this release! Price: $20.00. These professionally produced Bible study curricula draw on the lessons of Mayberry. We are all familiar with the parables in the Bible. But that's not the only place you'll find them. Parables are just short, simple stories that contain a moral message. PARABLES FROM THE FISHIN' HOLE provides several good examples to study. VOL. 1 contains four sessions using these episodes: "Dogs, Dogs, Dogs" (Mercy Is as Mercy Does); "Andy Discovers America" (Words RULE! ); "Class Reunion" (Contentment Is an Inside Job); and "Andy's English Valet" (Love that Isn't Gift-Wrapped). VOL. 2 explores the character traits of humility, self-control, patience and forbearance. Study notes are equally suitable for young and old, first-timers as well as seasoned students of the Bible. Laugh and learn from the Mayberry gang in this delightful approach to building character. This volume contains four sessions using these episodes: "The Big House" (A Study on Humility); "The Darlings Are Coming" (A Study on Self-control); "Mountain Wedding" (A Study on Patience); and "Rafe Hollister Sings" (A Study on Forbearance). Save by ordering both volumes (a total of eight sessions) at the same time. This brand new item is really fun. It's measures almost 4 inches high and a little over 4 inches in diameter at the opening. It features a color photo of Andy and Opie fishing for Old Sam and photos of Gomer and Barney pioneering in "Back to Nature." 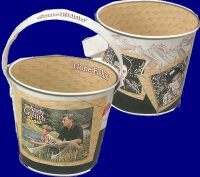 The pail is perfect for pens and pencils or paper clips (you can pretend they're fish hooks). Or better yet, use it for candy or other treats! Opie might use his for carrying fishin' worms. Aunt Bee thinks it makes a nice planter for flowers. Ernest T. uses his for sizing his rocks (a snug fit in the pail means it's perfect for throwing). Otis uses his for measuring favorite beverages. In any case, it's a decorative, nicely-priced new item. Price: $5.00. Don't forget that Weaver's now has Gift Certificates for those who just can't decide what to get. Like all of the items at Weaver's, they're available online, by our toll-free number or by mail. The answers and prize winner for Miss Crump's Mayberry Quiz #54 (in the August "eBullet" http://www.tagsrwc.com/ebullet/archive/20020827.htm#QUIZZES) will be announced in the November issue of "The Pocket" newsletter and online in the December "eBullet." The 13th Annual Mayberry Days in Mount Airy was for many participants the best ever. Persistent rains on Thursday and Friday didn't dampen spirits. How could they with the return of BETTY LYNN, MAGGIE MANCUSO, HOWARD MORRIS, GEORGE SPENCE, and THE DOUG DILLARD BAND. And what's more, JAMES BEST and HARVEY BULLOCK were there to cinch this Mayberry Days as being one of the most special ever. Harvey Bullock received the Key to the City on Friday, but even if Cousin Virgil had polished that key into uselessness, it wouldn't have mattered because Harvey and his wife Betty immediately won the hearts of everyone in town, just as Harvey's writing had won us over from the first words of "Opie's Hobo Friend." There were all the usual festivities at Mayberry Days-golf tourney, VW Boys concert, Mrs. Wiley's Tea Party, pie-eating (won by a hearty-eater from Canada! ), pig-cooking, horseshoe pitching, apple peeling, flower judging, trivia answering (Pat Bullins got ALL answers right for her third straight victory! ), walking tours, parading (Harvey Bullock was Grand Marshal), autographing, shopping, movie-watching, mingling, eating, bowling-but there were several highlights. As always, the Doug Dillard Band concerts featuring Ginger Boatwright on Friday are special and are the cornerstone of every Mayberry Days. And Colonel Tim's Talent Time, hosted by David Browning, on Saturday night is a unique showcase of amateur and professional talents that always delights the sold-out crowd. There was even a surprise performance this year by Pink Floyd. And Howard Morris and Betty Lynn were on hand Thursday to help Maggie Mancuso unveil two dresses (designed by Bob Mackie) that she wore on "Andy Griffith's Uptown-Downtown Show" in 1967. Maggie generously donated the dresses to Emmett Forrest's collection of Andy Griffith memorabilia at the Mount Airy Visitors Center. But if you took a vote this year, the biggest highlight was probably having Harvey Bullock's be part of Neal Brower's lecture at the Cinema on Saturday afternoon. (By the way, Ken White, who pretty much runs the Cinema and is the resident jack of all trades, was the recipient of this year's Mayberry Friendship Award, the highest honor presented each year by TAGSRWC.) Neal's lecture is always exceptionally good and in the past two years has featured first writer Jack Elinson and then Betty Lynn as special guests. This year's lecture with Harvey will be hard to top. It was funny, informative and filled with wonderful sentiment. Just having Harvey Bullock attend Mayberry Days was special enough, but to be able to listen to him discuss episodes such as "The Pickle Story," "Mr. McBeevee" and "Opie the Birdman" was extraordinary. It was a satisfying Mayberry Days all the way around. As with other Mayberry events throughout the year, Mayberry Days is a terrific occasion for visiting with friends with a shared interest. The added dimension of being in Mount Airy with all of its wonderful people gives Mayberry Days that little something extra that seems to conjure up truly magical moments time after time. Pat Coleman of the Remembering Mayberry Chapter (Chillicothe, OH) adorned in her "Mrs. McBeevee" hat gets a brush with greatness meeting Harvey Bullock. Two new characters showed up for Mayberry Days this year. Clarence Earp (Mike Creech) and Goober Pyle (Tim Pettigrew) joined in the Mayberry fun to the delight of the gathered fans. The Mayberry Deputy and Sheriff Rosco P. Coltrane (James Best) attempt to determine just who is the best. Jim Lindsey, Mr. Best's character on TAGS, sure make a good sheriff but the competition was a tie so far as fans could tell. 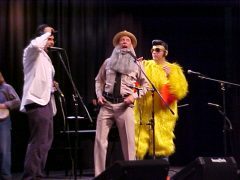 The Cut-Ups (Phil "Ernest T." Lee, David "Mayberry Deputy" Browning, & Ken "Otis" Junkin[not shown]) join "Pink Floyd" (Allan Newsome) on stage for a rendition of "Shop of the Rising Floyd" to the tune of "House of the Rising Sun" at Col. Tim's Talent Time. There's not much specific chapter news to report this issue. Much of the recent chapter activity has centered around attending Mayberry events, especially Mayberry Days and the Andy Griffith Parkway Dedication, both held in Mount Airy during the last few weeks. There were more than 60 chapters (and 27 states and Canada!) represented at Mayberry Days, and several dozen chapters (and 15 states and Canada) in attendance at the parkway dedication. Fans have also been flocking to the recent Don Knotts/Tim Conway concerts in places such as Mississippi and South Carolina. In other chapter news, for those following the progress of the replica of Taylor home being built (to live in!) by members of Mayberry Troop #44 chapter (Clear Lake, Wis.), you'll be glad to know that the framing is complete and that the home and garage are now pretty much enclosed-just as the first winter snows were dusting the roofs. They're now working to get as much done outside before concentrating on the inside during the usually harsh Wisconsin winter. Our "Who's Been Messin' Up the Bulletin Board?" chapter on the Internet (http://www.wbmutbb.com/) sponsored a silent auction and raffle that raised over $2,000 for the Surry Arts Council (organizing body for Mayberry Days). The chapter collected donated items from members and others and also manned the tables during the auction. TAGSRWC member Steve Barfield and his company, Consumer Concepts, was a major sponsor of Mayberry Days 2002. In addition to sponsorship funding, Consumer Concepts helped with manpower and co-sponsored with TAGSRWC the Raffle for a dinner with the Mayberry Days stars and autographed Mayberry squad car cookie jar (won by Dean Pace of Columbus, N.C.). The raffle and related sales raised about $1,000 for the Surry Arts Council. (By the way, your purchases online at Weaver's Dept. Store and at the Weaver's booth in the Main-Oak Emporium in Mount Airy year-round provide additional financial support for Mayberry Days and other Mayberry events.) Barney chapter (Greensboro, N.C.) was also instrumental in arranging airfares for Harvey and Betty Bullock to attend Mayberry Days. In other news, Mayberry chapter (Knoxville, Tenn.), "Doggone Firefly Hit Me, Knocked Me Right Down" (Huntingburg, Ind.) and The Mayberry Undercover Agents (Danville, Va.) have all produced recent chapter newsletters, all of which have been outstanding, as usual. The Undercover Agents, though, have put their newsletter, "The Mayberry Minute," on hiatus as they focus more on their full slate of other chapter activities. We also have some somber news to report. We're sad to have news that two chapter founders have passed away since the last "eBullet." As an organization with 20,000 members worldwide, it's not practical or possible for us to report or even to know about every loss. But these are two people with whom many other members and chapters have had contact over the years, so we wanted to make sure we got notification out about their passing. We're sorry to report that Linda Daniel of "You Ain't Heard the Last of Ernest T. Bass" chapter (Glen Daniel, W.V.) passed away from leukemia on Sept. 12. She and husband Perry (Whimpy) and daughter Alysia were familiar faces at Mayberry Days over many years. (Whimpy and Alysia found it "therapetic" to be among Mayberry friends this year as well.) TAGSRWC has honored Linda's memory with a contribution to a local scholarship fund established in her name. Longtime readers of TAGSRWC newsletters and Mayberry books will recognize the name Jim Schwenke. He was founder of the Mayberry Texans chapter in Houston. It is with great sadness that we report that Jim passed away on Sept. 13. In large part because of Jim's enthusiasm and hard work, the Mayberry Texans chapter grew to more than 200 active members at its height. But it was Jim's heartfelt devotion to the little things that was perhaps his greatest contribution to Mayberry and TAGSRWC. He tirelessly tracked down leads for locating information about cast and crew members, as well as locating the actual people themselves. But most of all, it was Jim Schwenke's great friendship that those of us who were fortunate enough to know him value the most. He and his wife, Alice, had attended several events over the years and got to meet many fans. Though health concerns kept them from traveling as much in recent years, Jim was one of the all-time great correspondents and stayed in touch with countless people. 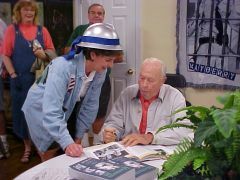 He will continue to be an inspiration and a model of Mayberry friendship for years. In addition, to his wife Alice, Jim is survived by daughter Jean and son Jim. TAGSRWC has made a contribution in Jim's memory to the Houston Zoo, another of his many interests. Our condolences and prayers continue to go out to the Daniel and Schwenke families. Between issues of "The eBullet," keep up with the goings-on in Mayberry with the more-or-less daily "Who's Been Messin' Up The Bulletin Board?" Digest. It's a free subscriber list made up entirely of comments, news flashes, and questions and answers from subscribers. You can sign up for that list by going to the "Mailing Lists" link at http://tagsrwc.com. TAGSRWC also publishes the "Weavers Newsletter" in alternate months to "The eBullet" is an online successor to our longtime printed newsletter, "The Bullet." Like "The eBullet," the "Weavers Newsletter" is free. Its focus is mainly on new Mayberry merchandise and collectibles and quick news flashes. And if you like to receive Mayberry information on good, old-fashioned paper, we have a publication called "The Pocket." It's a four- to eight-page newsletter that contains highlights from "The eBullet" and the "Weaver's Newsletter." Since "The Pocket" involves printing and postage, there is a fee to receive it. (It's $10 to receive all five issues for 2001 and 2002. You can add last April's final 32-page issue of the printed "Bullet" for $5 more.) 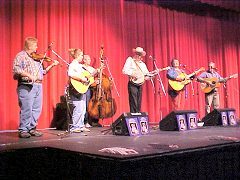 You can sign up for "The Pocket" online at http://www.iMayberry.com/tagsrwc/weavers/thebullet.htm or by writing to TAGSRWC, 9 Music Square South, PMB 146, Nashville TN 37203-3286. "The Pocket" will continue with additional issues for 2003 and 2004. There are several subscription options for brand new subscribers. All current subscriptions to "The Pocket" expire with the November 2002 issue. Renewals for all subscribers can be done online right now at http://www.tagsrwc.com/weavers/ and through the renewal form in the November issue of "The Pocket." Or you can receive for a free sample issue by writing TAGSRWC, 9 Music Square South, PMB 146, Nashville TN 37203-3286 and sign up with the form provided. TAGSRWC's other main vehicle for Mayberry information is simply our Web site itself at http://tagsrwc.com. It has extensive content and links for just about everything a Mayberry fan might be looking for. The next issue of "The eBullet" is scheduled for mid-December.